A once-powerful hurricane twisted and drifted away from Hawaii, leaving behind heavily saturated ground on the Big Island and many residents on other islands relieved it didn’t wreak more havoc. Firefighters on the Big Island rescued 39 people from floodwaters Friday through early Saturday as the island grappled with the nearly 4 feet of rain from Tropical Storm Lane, formerly Hurricane Lane, dumped on the eastern part of the island over the course of three days. “It was almost biblical proportions,” said Kai Kahele, a state senator who represents Hilo. The ground was soggy on Saturday, he said, and it was still raining. But Hilo is accustomed to rain, he noted. And the Wailuku River, which raged with runoff, has a name that means “destructive water” in Hawaiian. Native Hawaiians who have lived in the area for hundreds of years know how dangerous the river can be, Kahele said. Hawaii County Civil Defense spokeswoman Kelly Wooten said teams were assessing damage but continued to focus on recovery efforts because of the ongoing precipitation. Big Island Book Buyers in Hilo opened as normal Saturday morning after owner Mary Bicknell saw a bit of sunshine. 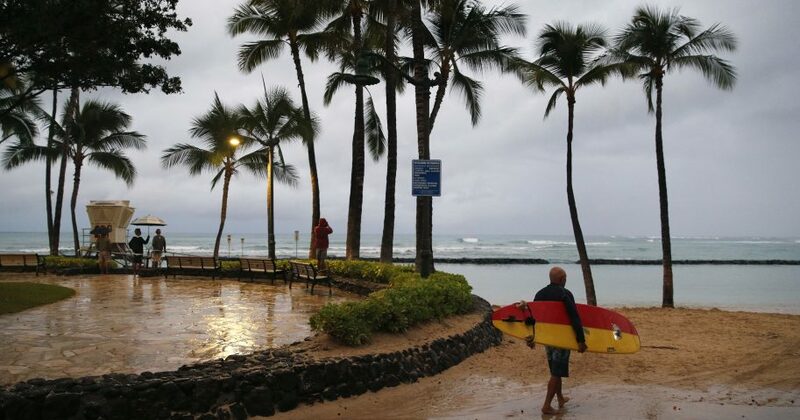 About 200 miles and several islands to the northwest, tourists on the island of Oahu wandered Waikiki Beach and took leisurely swims as shopkeepers prepared to reopen. He worried, however, that the near-miss would give residents a false sense of security.